Come and see us at A Place in the Sun Live! 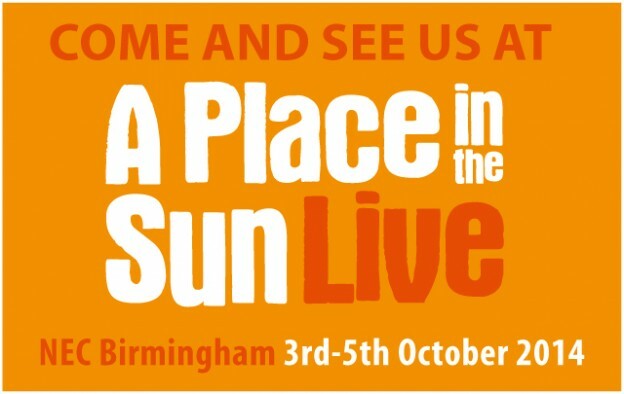 Worldwide Lawyers are excited to announce that we will be at A Place in the Sun Live which takes place at the NEC Birmingham on 3rd-5th October 2014. A Place in the Sun Live is the official exhibition of the hit overseas property TV show and is the perfect place to find your holiday home, investment property or retirement pad abroad. The exhibition not only includes over 150 property agents and developers selling thousands of properties right across the globe but also features specialist advice from experts regarding currency, tax, and legal matters. Properties on offer range from £20,000 to over £1million and are located across various countries. There are also specialist zones for France, Florida, Italy and Portugal providing free specific buying advice. You can also take advantage of the free advice seminars , Q&A sessions with experts from across the industry as well as exclusive show offers and discounts. Worldwide Lawyers are also able to offer FREE tickets for this event – all you need to do is click on the A Place in the Sun picture bar below. So why not come and see us at A Place in the Sun Live and see how we can assist with your overseas legal needs! WE WILL BE AT STAND E63.